Spesialfuglekasse i bjørk med åpen front. Laget slik at den ikke lett spjærer. 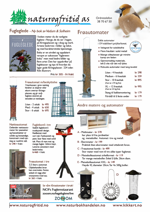 Egner seg for rødstrupe, gråfluesnapper og linerle. An attractive and natural Silver Birch log Nestbox with open front, specially rebuilt to prevent splitting. Suitable for Robins, Pied Wagtails and Spotted Flycatchers. The thick sides provide good insulation for nesting birds, whilst the natural appearance allows the nestbox to easily integrate with both the ornamental and woodland garden. Made from naturally durable FSC timber, the nestbox requires no maintenance. To clean or inspect, remove one screw and swivel lid. Siting:Locate the box 1.5 - 2m high on a tree, wall or fence secure from predators and face the box between N and SE. For Robins and Wrens site within shrubs/plant cover.